Why shocking? Well, because for the first time in three and a half years, it is entirely one color. That’s right, the streaks are gone. As I’ve let my hair grow, they’ve gotten harder for me to maintain on my own (well, without making my bathroom look like an abattoir), so I decided it was time. You might also notice a slight texture difference. In the last couple of years, my hair has gone from stick-straight (which it was my entire childhood) to wavy. It’s been getting a little curlier, so I decided to play. Since Friday, I’ve been using some of the Curly Girl methods (following in the footsteps of my darling friends Cristi and Rosi, who have some of the awesomest curls I’ve ever seen), and what you see here is the result of that. We’ve moved beyond waves, and those are some honest-to-goodness ringlets there. I’m hoping as I continue to do this, I’ll get even more defined curl. 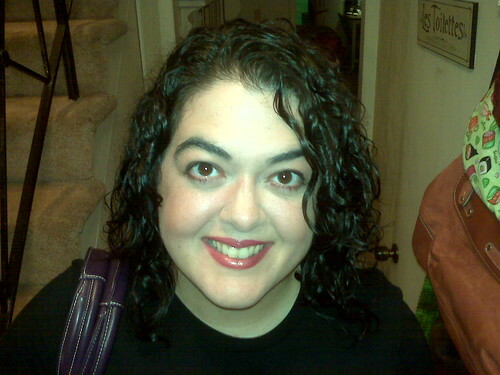 June 9th, 2009 | Tags: Hair | Category: Misc. 26 comments to Shocking New Hair! Wow! That’s loverly, Pam! I have spent a lot of time, money, and tears on trying to have wavy hair, and here you achieve it so easily…gah! If you’re done with your stripes, can I have them?? Cute curls!!! I like visiting Curlyville—but only visiting. What’s with the suddenly turning wavy/curly? My stick straight hair has been going that way too. I’d like to keep the stick straight hair, without having to mess with it in the am. Oh, and your curls are cute, and you look great in this picture!! Also, my hair has gone wavy as well, especially since I cut it off. Can you linky anything specific about the curly methods you use? Nevermind on the linky. Found some google stuff and some odd arguments about which curly girl methods to use. Methinks I will just get the book from the library. That’s a great picture of you! Your eyes look so big, and I love the curly-girl look. Beautiful hair and smile, sweetie! Love it! My hair went from straight to wavy to curly when I hit puberty! And it get curlier every year and I love it! It’s so cute! I am jealous. I wish my hair would go curly. Sigh. I think it looks great — I love the curls!!! I’ve been growing mine out a little bit as well; it’s a bit wavy. Adorable!! Girls with curls are lucky indeed! Wow, curls! There’s no method in the world that would make my stick-straight hair curl, but I love those ringlets. They’re very cute. Who are you and what did you do with Pam? Lovely photo of you…your hair looks great!! Never mind the hair… you have the prettiest eyes! Maybe it’s the new ‘do that makes them more the focal point. and what’s that purple thing on your shoulder? WHOOOOA! I’m DIGGIN the new look! You look great, chica! I’m gonna have to send you some gel I made for them curls. What’s up with the straight to curly? Me too! Thanks for the Curly Girls tip, bought the book a week ago and my wavy hair is now officially curly. I’m loving it almost as much as lip gloss! Did you know you had curls??? Wow!! I covet them.